The Handwoven magazine 2012 collection focuses on a variety of hand weaving patterns and projects, like waffle weave, color-and-weave structures, fabric embellishments and more. Discover all five issues of Handwoven magazine, exactly as they were printed in 2012, featuring articles on how to weave structures like waffle weave and shadow weave, as well as looks at fabric embellishments and more! You will find over 900 pages full of weaving tips and techniques, complete looks at weaving patterns and structures, as well as all the weaving projects Handwoven is known for. 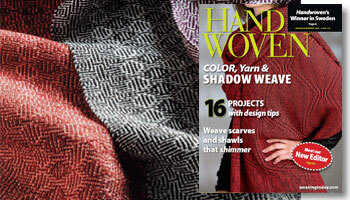 January/February 2012—Learn about the different color-and-weave patterns and effects, from elegant shadow weave to fun pinwheels to simple log cabin. Weave shimmering shadow-weave scarves in Tencel or wool scarves with one of eight different pinwheel designs. Other projects include a V-shaped shawl, a shadow-weave Möbius shawl, and a sweet chenille baby blanket. 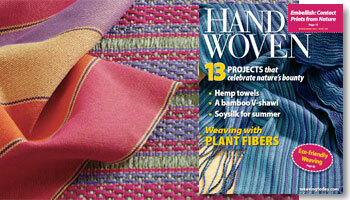 March/April 2012—Explore a wide variety of different plant fibers with this issue dedicated to yarns that come from the earth. Articles and projects cover not only well-known plant fibers such as cotton and linen, but also more unusual yarns such as hemp, raffia, and even lavender. Projects include hemp towels, linen rugs, and a Tencel collapse-weave scarf. 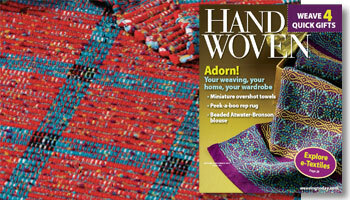 May/June 2012—Add some new weave structures to your weaving repertoire including taqueté, an unusual waffle weave, and diversified plain weave. 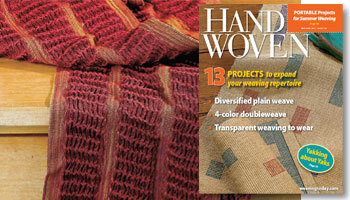 Also featured in this issue are portable projects and ideas perfect for summer weaving. Projects include waffle-weave tea towels, a portable marudai for kumihimo braiding, and a summer plaid scarf made on a rigid-heddle loom. 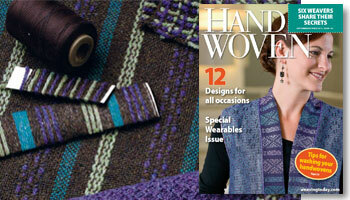 September/October 2012—Wear what you weave with this issue dedicated to handwoven apparel. From loom-shaped and “no sew” garments to exquisitely tailored items, there are projects for weavers (and sewists) of all levels. Projects include a woven shibori vest, an elegant men’s waistcoat, and a stash-busting loom-shaped vest woven on a rigid-heddle loom. November/December 2012—Embellish and adorn your handwoven fabric with lace, colorful miniature overshot, and shimmering beads with the projects in this winter issue. Learn how to weave e-Textiles that literally glow. Projects include a sparkling snowflake runner, a lacy silk vest, and a not-quite-rep rug.